Wonder Woman has always been a second-tier character for reasons largely having to do with her incoherent, if interesting, origins. Created by psychologist William Marston specifically to be the opposite of too-violent heroes like Batman and Superman, to be “psychological propaganda for the new type of woman who should rule the world,” she is a princess from a fabled tribe of mythic warriors “who would triumph not with fists or firepower, but with love.” While an anti-war warrior, particularly one created in the midst of World War II, has a certain subversive appeal, a superhero who disdains violence and implores that “Bullets never solved a human problem yet!” is not one that will enthrall teenage boys, bustier and thigh-high boots aside. The character has languished for most of her life as the token girl even as one writer after another has tried to inject some life into her, although friends who are far more knowledgeable than I about the history of superhero comics say there have been a couple of decent Wonder Woman story arcs. Her lack of a famous antagonist — Superman has Lex Luthor, Batman has The Joker — is also telling. Fighting inequality may be the noblest of pursuits in the real world, but a comic book hero needs something more concrete. Screenwriter Allan Heinberg, working from a story that he co-wrote with Zach Snyder and Jason Fuchs, attempts to address these two fundamental issues, but doesn’t have much success. First, he wisely shifts the action from World War II to World War I. If you’re going to have a character who believes that violence never solved anything, you probably don’t want her espousing such things in the middle of the only war that most Westerners believe was entirely necessary and justified. Second, he recasts Wonder Woman’s Greek mythological origins into a Christian framework. In the movie’s telling, Zeus functions less like the inveterate lech that he is and more like the Christian God, Ares is the Devil, and Wonder Woman is the result of a virgin birth who exists to redeem mankind. During her climactic battle with Ares, she even has a Garden of Gethsemane moment where Ares tries to tempt her into destroying mankind. “I believe in love,” she replies. (It’s almost too perfect that Wonder Woman is played by Gal Gadot, an Israeli Jew.) A tribe of separatist pagan female fighters lead by a princess modeled on Athena — one who contrasts to the untamed bloodlust of Ares by emphasizing wisdom and deliberation in pursuit of a just war — seems like a more fruitful direction for the character, but hey, what do I know? Maybe the near universal praise of the movie by Buzzfeed SJW types really is proof that they’re motivated by a quasi-religious fervor. Director Patty Jenkins hits the requisite rah-rah grrlpower beats but she’s also canny enough to emphasize some opposites-on-the-run/fish-out-of-water moments with heartthrob Chris Pine, who plays intelligence officer Steve Trevor, that vaguely recall the romantic comedies of the thirties. (I can’t help wondering if Jenkins didn’t pattern their relationship after her working relationship with Zach Snyder. CGI filmmaking is a peculiar beast that Jenkins had no previous experience in, so it’s only natural that she needed someone to show her the ways of that world.) 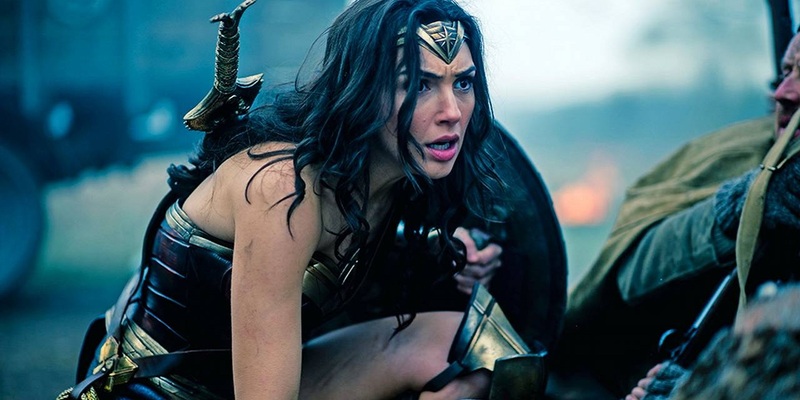 Jenkins does her best to give Wonder Woman a fighting style that comports with the character’s nonviolent philosophy by emphasizing defensive maneuvers with her shield and deflecting bracelets, but the action scenes overall are uninspired. A major reason why they scenes don’t work is that, like Rey in Star Wars: The Force Awakens, Wonder Woman is so adroit and capable that you never get the feeling she’s encountering any real obstacles. We never really see her thwarted, forced to adjust, or thinking. The movie is the sports equivalent of a baseball or football game where the home team routs the visitors. The lack of a strong villain severely hampers the action. We’re given three baddies — a mad female scientist, a roided-out general, and Ares himself — but instead of making the movie feel more epic, they steal focus from one another. (Star Wars: Rogue One had the same problem.) Similarly, Wonder Woman is surrounded by the requisite ragtag, but unnecessary, supporting cast. (Yet again, Star Wars: Rogue One had the same problem.) Reducing the number of characters would’ve gone a long way towards trimming the movie’s way-too-long 2:21 run time. Gadot herself carries the picture adequately but, aside from the few brief moments mentioned above, she doesn’t have much do apart from looking fabulously fierce in her costume. Maybe now that the filmmakers have got the clunky backstory out of the way and demonstrated their respect for Wonder Woman’s origins, in the sequel they’ll give Gadot and audiences not what they want, but what they need. Jill Lepore, the Harvard historian who literally wrote the book on Wonder Woman, says she’s “plainly the best” of all the major superheroes without ever telling us why. Jenkins on why they shifted the timeframe: “World War I is the first time that civilization as we know it was finding its roots, but it’s not something that we really know the history of.” Kudos to you if you can make sense of that. When it comes to a strong woman navigating the horrors of The Great War, I far prefer Francois Ozon’s Frantz released earlier this year. Amazon Prime subscribers can stream it for free. This entry was posted in Movies and tagged Gal Gadot, Patty Jenkins, superhero comics, Wonder Woman. Bookmark the permalink. I didn’t think the movie deserved near the praise it got either, but boy your review reeks of condescension and not a little sexism, particularly your aside doubting Jenkins’ ability to direct a CGI movie without the close, personal attention of a man. And for what it’s worth, it was a helluva lot better than goddamn Baby Driver. It’s very likely she had Snyder’s help, but that’s not a knock on her. If Scorsese decided he wanted to direct a comic book CGI tentpole I bet he’d need instruction or else rely on his first AD. There’s no shame in the fact that William Wyler didn’t direct the action sequences in BEN HUR. Actually, in Wyler’s case there is shame in the fact that he didn’t direct the action sequences in Ben Hur . . . because those are the only good parts of the movie. Among the major DC characters, WW seems more interesting than Superman, who is kinda boring, though she doesn’t have as much appeal as Batman. I just finished the movie and agree with your assessment. It’s watchable enough, but not much better than the other fare on offer from the DC universe. The CGI scenes were quite bad: goofy and cartoonish. It does seem that comic book sequels are quite often better than the first movie: Superman II, Spiderman 2, The Dark Knight and a lot of X-Men movies spring to mind. That isn’t always the case (see Burton’s Batman, Iron Man), but it’s frequent enough to be notable.